What are your running performance goals? That extra edge to run farther or faster? Or simply less pain in your feet, knees & hips? I understand both the joy and the pain of running a 10K or finishing a marathon. I know because I’ve done those things. Let me work with you to reach your goals so you can get the most from the sport you love. What do you need to reach those goals? Does your program include all of those? Some of them? None of them? If you’re missing any of those components, check out how our running philosophy and how our program works! Our running program begins with a detailed consultation including a review of your running history and discussion of your goals. Video Gait Analysis. While all of us have unique running styles, there are technique problems that our digital, computerized analysis can pick up to improve running mechanics. Our analysis system allows us to pick up gait errors (like overstriding, overpronation, crossover) any of which may lead to injury or may be keeping you from reaching your running goals. Gait Retraining. Using the results of the video analysis, we are able to improve your running by teaching a more economical, efficient way to run. How? Shoe screen & prescription. By evaluating your shoe’s wear patterns and looking at the alignment of your feet, knees & hips, we can tell you what type of shoe is most appropriate for you. Running-specific strength & flexibility. Running, whether for 20 minutes or several hours, requires your muscles to work overtime. 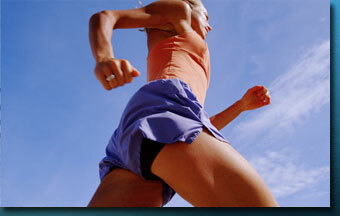 Our program gives you the right exercises to run more efficiently. Performance plyometric program. Plyometric — or jump training —exercises have been shown to improve speed, explosiveness, and jumping ability while reducing the risk of injury. Further, as it concerns running, it has consistently been shown to improve running economy, efficiency and speed. Meaning, you can run farther and faster while expending less energy. We combine plyometrics with specially chosen strengthening exercises to give you that performance edge. Training Program. Using your goals, my colleagues at Quest can provide an individualized program just for you. Runners CANNOT stand to stop running! Have you been relegated to the dreaded elliptical or pool? What do others have to say about this running program? “The video analysis was amazing. It picked up a flaw that I didn’t know caused my foot pain. Correcting it and getting in the proper shoes helped me finish the Chicago Marathon. And I could even walk the next day!” – Jake W.
my entire leg. The analysis allowed my physical therapist to design an exercise program that addressed the instability.” – Jessica K.